Hasselblad Chief of Strategy Ming Thein discusses a recent shoot that he did with Swedish car manufacturer Koenigsegg. The unique images that he and his team created aren’t quite like anything we’ve seen before. The shoot involved using the Hasselblad H6D-100c, DJI drones including the beastly Matrice 600 and Broncolor lights to capture light trails and a highly detailed shot of the car frozen in motion, all within a single exposure. For the majority of the shoot, Ming used the H6D paired with the HC 100mm f2.2, HC 50mm f3.5 and HC 150mm f3.2, with the bulk of the images being captured using the 100. But the most unique images from the shoot were captured using the H6D mounted on the Matrice 600 drone at night. Lighting was also a challenge, particularly during the night sequences because working at such narrow apertures and trying to capture the car in motion, required a lot of flash power. For the shoot, the team used the Broncolor Siros 800s units to help freeze the action, but even 800 watts was quite enough in the unique scenario that the team came up with. 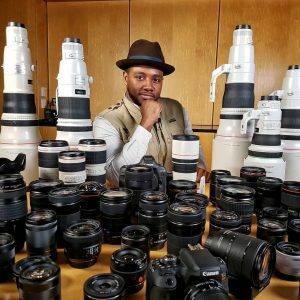 “What you can’t see is that in a lot of those shots, the flash heads are doubled up and they are 800W/s flashes, so there’s quite a lot of juice going out,” Ming explained. Speaking more philosophically about the challenges that face photographers today and some of the inspiration behind creating something challenging and new on this shoot with Koenigsegg, Ming said: “The job of photography, especially today, is to show us something that perhaps can’t otherwise be seen. Whether that’s because it’s a fleeting moment or it’s a transient moment, or it’s something our eyes can’t do like long exposures. We have to push the limits in creativity, to ask ourselves what extra can we give the photograph to make it unique and therefore hold the viewer’s attention.” Ming Thein goes into great detail on his blog about the shoot, so definitely give that a read as he shares valuable insight into creating and delivering a large scale commercial shoot. Watch the video above to learn more about the process of this project and to see more of what went into creating this collaborative shoot.